This episode of The Backyardigans is the first to actively acknowledge its own musical genre. 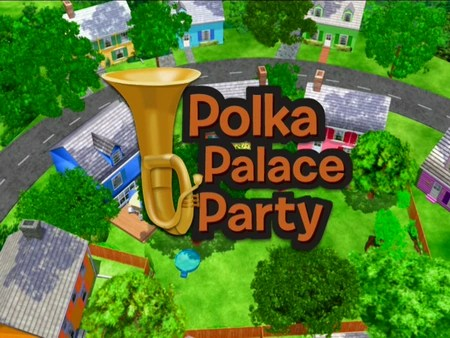 The “polka” in “Polka Palace Party” is not a reference to polka dots or simply a silly word for alliteration purposes, but the actual music style for this episode. The characters are all individual polka musicians – and very talented ones, too – who meet up to play at a birthday party. One of the programs that The Backyardigans has been compared to is Disney’s Little Einsteins; a fair comparison, since they both use music to enhance their lessons, though vastly different in style and execution. Which show is more entertaining is a matter of personal preference, of course, and one of the things that distinguishes Little Einsteins from other music-oriented shows is the announcement of the composer or musical genre featured in each episode. The Backyardigans doesn’t do this; in fact, the setting often is in wild contrast to its music’s origins (as in “The Key to the Nile,” which was not Egyptian, but Broadway). Not only does this avoid unnecessary stereotyping, but also keeps tried-and-true music styles and songs fresh and interesting. “Polka Palace Party” is one big love letter to polka, specifically German-American polka, which is the most common that is played in the Mid- and Western United States. Tyrone plays the most important instrument, the tuba, while Uniqua, Pablo, and Austin accompany him on the clarinet, accordion, and drums, respectively. Their instruments act as sort of Peter and the Wolf-style leitmotifs for each character, coming together in a wondrous quartet for the grand finale (after a lovely rendition of “Oh My Darling, Clementine” for Sherman the Worman). A small side-story is how much they all love their instruments, and it all seemingly ends in tragedy when the instruments disappear over a waterfall – right before they have to perform. Disheartened but unwilling to abandon their friend, they go to the party anyway, where, in true deus ex machina fashion, their instruments are waiting for them. Tyrone: The other wormans found them in the river! Austin: And took them out? Pablo: And dried them off? Uniqua: And set them up? The episode is also a shout-out to Wyoming, judging by the stunningly beautiful backgrounds, especially the shot of the polka palace itself. The animation has slowly improved as the season goes on, and will continue to do so. Sherman the Worman makes his first appearance in the show (if you’ve been following these reviews), but he and his worman friends will pop up again. Overall, this episode is less to do about a specific lesson than once again reiterating the importance of friendship and teamwork, along with musical appreciation. What type of music does your child enjoy? Sorry for the Hiatus, Everyone!